The BNB has had two pieces of bad news these last few weeks. Joan Oldham has informed committee that she is unable to do the raffle any more. On behalf of the committee we would like to thank her for all her efforts and work she has done on this function. Her raffle makes a significant contribution to our funds and she will be badly missed. Then the committee also heard that Carole Smith, who does our social group organisation, also wants to stand down after a long time doing a fantastic job in organising and arranging our excursions and visits. Again on behalf of the committee we would like to thank her for all her efforts and work she has done. She also will be badly missed. This sad situations gives rise to a need to replace these ladies’ efforts and the committee would like to hear from anyone who would like to run these functions. We need 2 volunteers one to run the raffle and the other to organise the social group excursions. If you feel you could help or would like to volunteer please contact Sue Quittenton. I have found this year’s report to be a difficult one to write. Not because there is nothing to report but because there is too much. Also not all of it may seem to be obvious progress. As with much work associated with running an organisation most of it is of the hidden variety. The majority of the work has been behind the scenes to put back some structure and understanding into our organisation that has slipped a little over the last few years. Liberal interpretations of our constitution couples with misunderstandings and a lack of adequate links with our parent organisation has led to situations that were not to the advantage of the organisation and in some instances bordered on compromising our charitable status. Your committee has addressed many of these issues and although the work is not yet complete the foundations have started to be laid that will make BNB a stronger and better organisation for the future. The year started with an assessment of the state of health of the organisation. It seemed appropriate and natural to do this. Up until now each new committee would start off without any declared aims, identification of issues to be addressed or a medium term plan. Therefore the first thing we did was to generate a strategy document or manifesto. This working document was very crude at first but as we started to understand the mechanisms that gave rise to some issues (hidden and otherwise) it improved until we had a document that set the scene for the immediate future. The document showed up some significant slippages in our understanding of the constitutional and financial issues. It also pointed to areas that the committee needed to look at with some urgency. Under the guidance and instruction of the Third Age Trust to bring this up to date and adopt a new legal document for the governing of our organisation. This is necessary as we have not undertaken any of the modifications that we have been asked to do by the Regional Office of the Third Age Trust. The reason for this omission on our part is lost in time but our constitution is out of date and borders on inadequacy. Although we can retrospectively implement past requests it has been decided by the committee to adopt an up-to-date new model constitution that has been prepared for new U3As. Its adoption will thus be quick, pre-approved, and be in-line with current legal requirements. This new constitution will be presented later in this AGM LINK> New Constitution . The financing arrangements of the interests groups. Our membership has effectively remained static or dropping slightly. We are an organisation of about 300 people in a ‘catchment’ area of 46,500 relevant people who qualify for the U3A and we should be doing better. Based upon the current methods of funding and financial structure we used a standard financial model to explain the way BNB works financially and this can be used to budget expenditure over the coming years. However until the group funding method is resolved this cannot be implemented effectively. The committee understands that a good financial understanding is essential to the good operation of the organisation. We found that our publicity material is non-existent. We usually use ‘head-office’ material and brochures which are not that relevant to what we do. We have nothing that is specific to BNB and the interest groups that we support. There is nothing to let people know what we are about – the one reason why most join us. The committee during the year has produced a suite of pamphlets on each interest and two forms of a general brochure specifically for BNB. These will be used to let people know what we do and are for dissemination at open days, public libraries and other publicity opportunities. The cost of printing the quantity that we might require was found to be very high. After a costing exercise the committee decided that a high quality printer using high quality paper can print our requirements as we need them. This solution is about 25% of the cost of professional printing, carries no storage difficulties, can be tailored to the exact requirements of the event, and details in the pamphlets can easily be changed without waste. The strategy document showed the strange incidence that in an organisation set up to generate interest groups and foster their growth, only 30% of our membership attends any of the groups. It would appear that over 2/3 of the membership pay the membership fee and do not take part in any U3A activity. The committee tasked itself with finding out why there is so poor a take-up and what can be done to increase this figure. This work still continues. The greatest success story of the year must be the establishment of our new web-site. 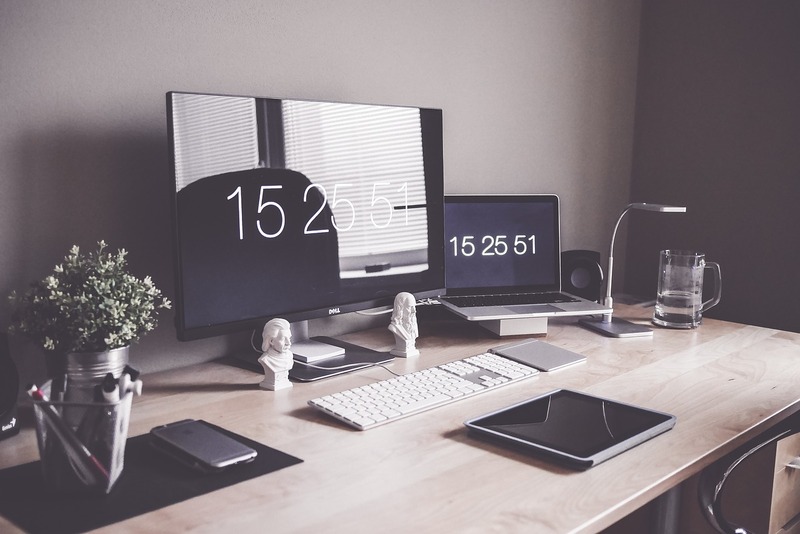 Although much is owed to the original web-master and the original site, the committee felt that bringing it up to date with a re-vitalisation was necessary. Thanks must go to our new web-master for completely restructuring the site and also to our past web-master for the support he gave in effecting such a change. We now have a new web-site that has a news page, details on the groups, documentation, relevant material and many other features. The committee feels that the web-site now provides a face to the world of which we should all be proud. As a consequence of our renewed interaction with the regional office of the Third Age Trust we have establish stronger links and can rely on them to help us sort out issues that are still present. This relationship should not be allowed to lapse as it gives us some much needed advice in areas that we wish to change. In the last year we have seen some comings and goings in terms of Groups. We have had two new groups start up – Cribbage and Peace Education. On the going front Greek and Roman History both came to their natural conclusion. In the coming year the Greek and Roman may be offered again if there is enough interest and it is hoped to start up the delayed British History in May/June. As outgoing Chairman may I take this last opportunity to thank everyone for their kindness, support, comments, arguments, admonishments, and opinions. Thank you all. What is the Joint Strategic Needs Assessment (JSNA)? It is a survey being carried out by Warwickshire County Council and its partners. So that we can establish a picture of the health and wellbeing of the Warwickshire population and use the assessment findings to inform the planning and delivery of services and support. This will help to ensure services and support are well-placed to help the people who need them most. If you have more than one person living in the home, then each can complete it from their perspective including school age children. 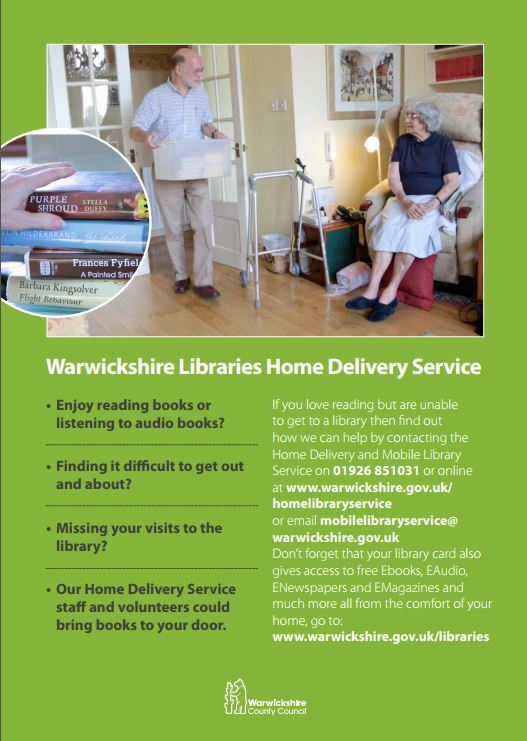 We have been contacted by the Warwickshire Library and Information Service concerning their Home Delivery Service which is a free library service for those who are unable to visit their local or mobile library due to ill health and infirmity. Volunteers call every four weeks with a selection of books based on customer preferences and they can stay and have a little chat with them about books and interests (as well as a lot of other things probably). There is a link to a promotional flyer for further information and we will be having some leaflets made available at our monthly meeting. Please Note: This service is for Warwickshire residents only. If you are from another county, then you will probably find that your own county provides a similar service. New tech device? Older device not working well? Need some help to do something specific? Come along to the Computer Group for help at all levels!